After much success on the streets of New York, we feel that we are obligated to share this yummy goodness with – well, the whole world! So, feel free to nibble on each satisfying morsel individually or pack it in by the mouthful; share with friends and family or eat it alone while you relish in the fact that each and every tasty bite is all yours. Our truck can be reserved for parties, graduations, weddings and nameless other events where you’d like to have something special and satisfying to serve. 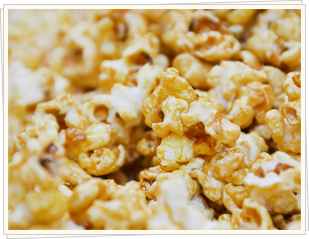 Our delicious popcorn is made fresh – all day, every day – seriously. Your gourmet popcorn is made to order and is shipped the same day it’s popped. Is that fresh or what? We take our gourmet popcorn passionately, right from choosing the perfect popcorn kernels to adding the best and freshest ingredients around. We guarantee that each bite will always be as good as the last one and every bag will always taste like you got it off our popcorn truck in the streets of New York. And if you’re lucky enough to see us out and about in the NYC, be sure to stop by and tell us your favorite flavors or try one of our new gourmet popcorn treats! Brooklyn, one of five boroughs in New York, is a multi-cultural and diverse city full of hard-working, loyal, popcorn-lovin’ people. Our richness in culture, ethnicity and long history makes it one of the best cities in the world. 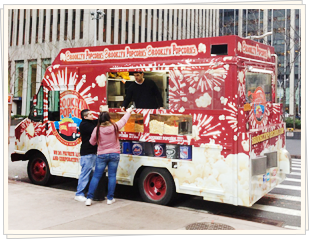 Not only is Brooklyn famous for having the oldest pizza restaurant in the United States, the Brooklyn Bridge and delicious Brooklyn-style pizza, but it is now also home to the first gourmet popcorn truck in the world! We boast home-grown talent like Alicia Keyes, Lady Gaga, Kiss and the Ramones – to name a few, but also home-grown heroes like the brave men and women of the FDNY and NYPD. 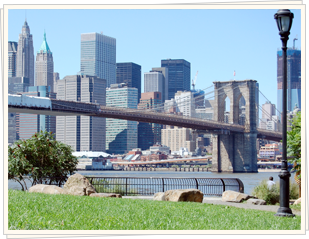 We love this city and want you to know that a little piece of the heart of Brooklyn goes into each and every tender popcorn morsel we serve. Now, you too can have a little taste of Brooklyn in each bite. Anything less, you can just fugheddaboudit! Thanks for stopping by and we hope to see you soon!